Despite the decrease in demand for large SUVs such as the Armada, Nissan has raised base prices substantially on the 2008 Nissan Armada versus 2007. That's typically a bad sign for resale value. The 2008 Nissan Armada has hunky good looks and a buff V-8 engine, but there are more roomier and more useful options among the big utes. 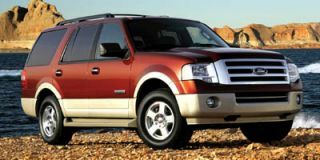 To compile this review of 2008 Nissan Armada, the automotive experts at TheCarConnection.com read through a wide range of reviews, citing the most useful comments. 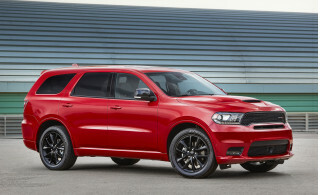 TheCarConnection.com's editors have driven the Armada and add their experience with the vehicle to this comprehensive review. The 2008 Nissan Armada full-size SUV caters to those who need serious towing ability along with space to haul up to eight passengers. The sturdy full-size 2008 Nissan Armada is based on the Titan pickup, so it's built on a fully boxed truck frame. The 2008 Nissan Armada comes with a 317-horsepower, 5.6-liter V-8, fitted to a five-speed automatic transmission and offered with either rear- or four-wheel drive. The powertrain affords a class-leading towing capacity of up to 9,100 pounds and has the capability to drive on ethanol-blend fuel. 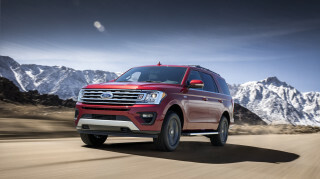 With 385 pound-feet of torque, it can move the 5,300-pound Armada quite authoritatively, even with a full load of passengers, thanks to the very responsive five-speed automatic, which doesn't hesitate to downshift when needed. Fuel economy is a shameful 12 mpg in the city, which seems optimistic next to single-digit real-world results. The 2008 Nissan Armada can handle up to eight passengers with standard second and third-row bench seats; second-row captain's chairs are also offered for a seven-passenger capacity. When the third-row seats are up, there's very little cargo space left. The front seats are quite good, and it's easy to find a good driving position with the available adjustable pedals. In general, though the design of the instrument panel is eye-catching, the materials and plastics inside still lag those used in top rivals. For 2008, new gauges have also been added, along with a lockable glove box. The front seats are perched quite high, which gives good forward visibility, though rearward visibility is impaired by the thick rear side pillars. The Armada rides firmly but quite smoothly, soaking up most major bumps, but all of its heft is felt in corners and when braking. Automatic dual-zone air conditioning, a 60/40 split fold-flat third-row seat, keyless entry, rear parking sensors, and the ability to play MP3-formatted CDs are all standard features on the Armada, which is offered in SE and LE models. 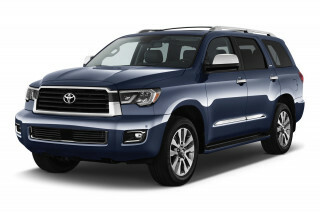 For 2008, there has been slight styling changes to the Armada that match those given to the Titan pickup, plus some alterations in standard equipment. LE models add a load-leveling suspension, fog lamps, a power rear liftgate, leather trim, front parking sensors, a rear camera system, and an upgraded sound system. Power heated folding mirrors have been made standard on 2008 Nissan Armada LE versions, and the Tow Package is now standard on the SE Off-Road edition. The 2008 Nissan Armada also gets 20-inch wheels as an option, as well as a power folding third-row seat, wood-grain trim, a heated steering wheel, a navigation system with XM NavTraffic information, and the available Music Box audio and DVD navigation system. Side curtain airbags and stability control are standard, along with anti-lock brakes. The LE model adds front side airbags, which are also available in the 2008 Nissan Armada SE model's Premium Package option. The Armada hasn't been crash-tested by the insurance-industry-affiliated IIHS, but in the federal government's tests, it received four- and five-star results in frontal impact protection. If you're looking for a big, bold SUV but want something more exciting than the domestics, consider the 2008 Nissan Armada. 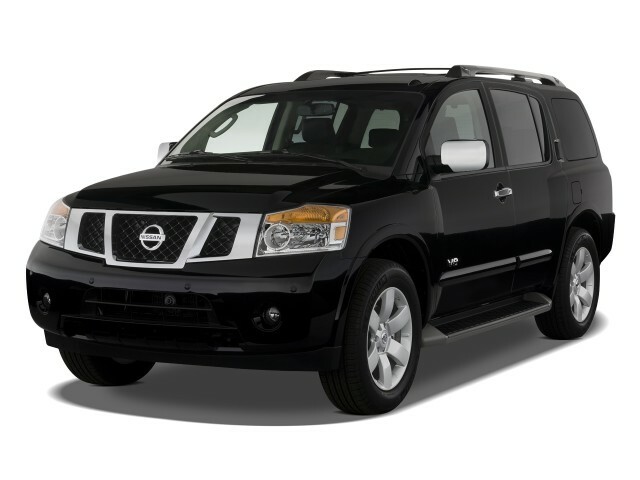 The 2008 Nissan Armada makes a serious statement with its large footprint and bulky exterior. It's hard to ignore the exterior of the Nissan Armada, which receives a face-lift for this model year. 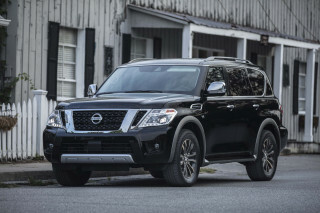 Edmunds says, “Its front fascia is nothing short of menacing, and its bumpers and fenders have the sort of bulging mass usually associated with power lifters and gridiron gods.” ForbesAutos notes "while not a fleet unto itself, the full-size Nissan Armada is certainly as large as some boats." Kelley Blue Book writes that the Nissan 2008 Armada features a "raised roof, arched door frames and huge side fender flares," which make it "one of the most ornate SUVs" that they've encountered. While Kelley Blue Book reviewers concede that the Nissan Armada's "unconventional styling may not be to everyone's liking," most others, such as Motor Trend testers, find that the Armada sports a "handsome body." Motor Trend adds that the Nissan Armada looks "chunky, modern, and sporty, and the big wheels and tires look great." The 2008 Nissan Armada will tow virtually anything and move quickly from a stop, but you'll find yourself stopped at a gas pump frequently. The 2008 Nissan Armada offers impressive power and exceptional towing capacity. However, the trade-offs for that performance are iffy handling and an incredibly thirsty engine that requires frequent fuel stops. Engine options are nonexistent on the 2008 Nissan Armada, as Edmunds notes the sole offering is “a 5.6-liter V8 that pumps out 317 hp and 385 pound-feet of torque." Reviews read by TheCarConnection.com rave about what ForbesAutos describes as the "generous low-end torque" that Nissan's 2008 version of the Armada's V-8 provides. ConsumerGuide testers also find that the "Armada delivers fairly strong takeoffs," and Motor Trend testers manage to go from "0 to 60 in a mere 6.8 seconds." In addition to incredible acceleration, the Nissan Armada's V-8 gives it a towing capacity that The Auto Channel says "beats out competition by more than 2,000 lbs." Aside from just one available engine, the Nissan Armada also offers just one transmission option; fortunately, reviews rate this highly as well. ConsumerGuide praises the "alert, smooth-shifting automatic transmission" that features five forward gears. ForbesAutos adds that one of the appealing features of the "Armada's automatic transmission" is that it "includes a mode that adjusts shift patterns during towing or hauling" for an optimum mix of power and fuel economy. Cars.com reviewers also point out that the Nissan 2008 Armada "is available with either two-wheel (rear) or four-wheel drive" on any trim. When it comes time to fill up your Nissan Armada, you will probably be disappointed to learn that, even for a full-size SUV, the Nissan Armada offers poor fuel economy numbers. Car and Driver lists frequent "trips to the fuel pump" as one of the Nissan Armada's low points, thanks to an EPA-estimated 12 mpg city and 18 mpg highway on two-wheel-drive models, which drops ever so slightly to 12/17 mpg on the four-wheel-drive versions. 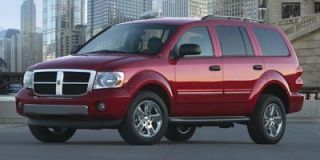 In general, reviews read by TheCarConnection.com claim that the Nissan 2008 Armada drives and handles like a smaller vehicle. Motor Trend observes that the Nissan Armada offers "great grip and no drama when cornering," though Edmunds reviewers feel that "the massive girth of this truck is obvious when cornering." ConsumerGuide calls the Armada's handling "clumsy in close quarters," and says the steering "has a firm feel, but Armada reacts slowly to inputs." When it comes to ride quality, Kelley Blue Book finds that "so long as the road remains fairly smooth the Armada maintains a very livable ride." On coarser surfaces, ConsumerGuide warns "jiggle is noticeable over patchy pavement and expansion joints." The 2008 Nissan Armada also boasts confidence-inspiring brakes, which Motor Trend praises as "superior to the other SUVs" in its class. The 2008 Nissan Armada suffers from some quality issues, but it offers exceptional first- and second-row room and comfort. At Nissan, 2008 brings a full-size Armada SUV that has received some interior quality enhancements, but they aren't enough to propel the big Nissan Armada near the top of its class when it comes to overall comfort and quality. In its standard configuration, ForbesAutos says the 2008 Nissan Armada has "seating for up to eight," though Kelley Blue Book notes that "an excellent set of optional second-row captain's chairs" reduces capacity to seven. The large dimensions of the 2008 Nissan Armada shine through when it comes to interior comfort, and reviews read by TheCarConnection.com unanimously praise the "roomy cabin," as Edmunds refers to the Armada's interior. Up front, Consumer Guide reviewers find "roomy, supportive seats" and "standard power pedals," as well as "standard tilt steering wheel" that allow drivers to "fine-tune a comfortable driving position." The second row also "outclasses the others" in terms of "headroom and legroom," according to Motor Trend. However, The Auto Channel writes "third-row passengers are going to feel smashed." In addition to providing ample seating room, the large 2008 Nissan Armada boasts commendable cargo space. ConsumerGuide praises the "terrific interior storage" on the Nissan Armada, as "bins, pockets," and "beverage holders abound." As for rear cargo storage, Edmunds says the "second and third rows are split and easy to fold flat, allowing one to optimize most any combination of people and cargo," but even with "both rows folded down, maximum cargo capacity stands at 97 cubic feet, which rates about 10 cubes less than the Armada's domestic rivals." One convenient feature of the folding rear seats is that "unlike some competing vehicles, the headrests do not have to be removed first," according to Cars.com. On previous model years of the Nissan Armada, the interior was sharply criticized for its low-quality materials. For 2008, Nissan has updated the Armada with "more soft-touch materials and wood-tone accents," according to Edmunds, though while "it's much more inviting than before, the Armada's interior still lags behind the solidly executed examples set by General Motors." 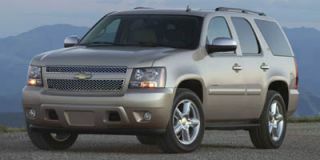 ConsumerGuide affirms that, writing "interior decor is mostly plain with materials that trail Armada's large-SUV rivals." ConsumerGuide also finds some build-quality issues, as their "test examples had various creaks and rattles, including a squeaking steering column." Despite the build-quality issues, the Nissan 2008 Armada offers a decently quiet highway ride. ConsumerGuide writes "wind and road noise are nicely muffled," aside from some "wind whistle from the cargo area." The 2008 Nissan Armada surrounds occupants with airbags and safety features. Crash-test ratings are probably the quickest measure of a vehicle's safety credentials, and the 2008 Nissan Armada sports very respectable scores on this count. While the Insurance Industry for Highway Safety (IIHS) has not yet crash tested a Nissan Armada, the federal government's National Highway Traffic Safety Administration (NHTSA) has. After conducting both front impact and rollover tests, the NHTSA awarded the Nissan 2008 Armada a full five out of five stars for front impact driver protection, and four out of a possible five stars for front impact passenger protection. The one crash-test figure that stands out in a negative light is the rollover rating, and The Auto Channel notes that the 2008 Nissan Armada "earned a rollover rating of three of five stars," which is not altogether unexpected on such a large vehicle. The 2008 Nissan Armada comes loaded with an impressive variety of standard features on both the SE and LE trim levels. Edmunds reviewers write that "Antilock disc brakes (with brake assist), stability control, front-seat active head restraints, rear parking sensors and side curtain airbags," along with a rear-obstacle-detection system, all come standard on every 2008 Nissan Armada. On the higher-end LE trim level, ConsumerGuide notes that Nissan has included "front side airbags" and a "front-obstacle-detection system." ForbesAutos offers on-road impressions of these systems, saying "brake-force distribution and brake assist are able to stop the charging Armada quickly and efficiently." 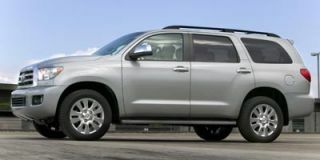 One area in which reviews read by TheCarConnection.com praise the Nissan 2008 Armada is driver visibility, which typically isn't a virtue on large SUVs. On the Nissan Armada, ConsumerGuide says "visibility is commanding," thanks to the Nissan Armada's "jumbo door mirrors and unobtrusive headrests." Kelley Blue Book adds that "the broad expanse of glass allows for good 360-degree visibility," while The Auto Channel writes that the "Rear Proximity Sensor System" will "beep when you are close to an obstacle," further aiding parking lot driving. When it comes to features, the 2008 Nissan Armada keeps families entertained in plush, roomy surroundings. The 2008 Nissan Armada is ahead of the curve when it comes to both standard and optional features. The standard features list on the 2008 Nissan Armada is above average on the SE and impressive on the LE. Edmunds testers find that the SE offers "full power accessories, a power driver seat, dual-zone climate control," and "an eight-speaker sound system with a CD changer and an MP3 input jack." On the LE trim of the Nissan Armada, ConsumerGuide tells you to expect "leather upholstery, 6-way power passenger seat, keyless access and starting, rearview camera, Bose sound system, [and] satellite radio." The upgraded Bose radio on the Nissan Armada LE is well received in reviews read by TheCarConnection.com, with Edmunds reviewers appreciating the "265-watt, 10-speaker" setup. Aside from the well-equipped standard Nissan Armadas, a variety of options packages is available for the tech-hungry. Kelley Blue Book writes, "if your kids are all about high-tech gadgetry and love on-board toys, the Armada has you covered," thanks in part to its optional "rear-seat DVD entertainment." Cars.com reviewers note that some of the improvements to the optional features for the Nissan 2008 Armada include "an improved navigation system with XM NavTraffic real-time traffic information" and a "larger LCD screen (8 inches)" for the optional DVD entertainment system. ConsumerGuide says that for Nissan, 2008 brings some other noteworthy options to the Armada, including a "power sunroof" and "Preferred Package" that brings "heated front seats," along with "power rear-quarter windows, [and] wireless cell phone link."